Moon Palace Golf & Spa resort welcomes TBEX attendees to Cancun for what is shaping up to be an amazing event. Beachside Turtle Release at Sunset 6:30pm – 7:30pm available daily September 10-15. Limit 30 people each day. To sign up for one of these special activities, email Sandra Gonzalez, Conference Concierge to make arrangements. We hope that your time here at TBEX is so enjoyable that you’ll want to return to Moon Palace. To help make that possible, we’ve created our Snap. Post. Win Giveaway. Take a photo of one of the resort’s famous landmarks listed on the postcard (the FlowRider, poolside at Nizuc, our nightclub Noir, margaritas on Moonlight Terrace, a paparazzi shot of a TBEX Presenter, your in-room jetted tub and other in-room amenities, and, of course, at the More Selfies in More Places party). 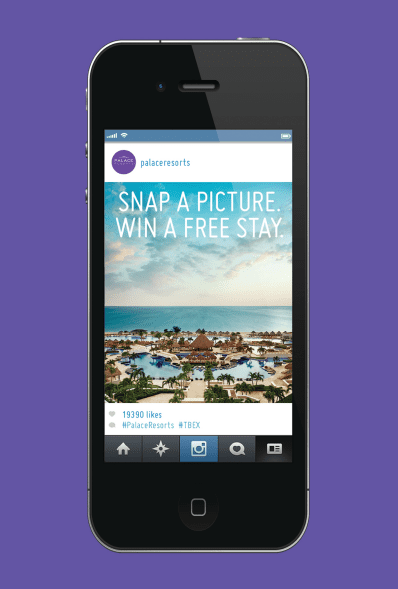 Tag the photo with #TBEX and #PalaceResorts and post on Twitter, Facebook and/or Instagram. Every post counts as a separate entry. More details can be found on the postcard in your welcome bag, and be sure to follow Moon Palace at @PalaceResorts. Palace Resorts representatives will be present throughout the conference and we hope you take a few moments to say hello. Cessie Cerrato, Public Relations Director, will be a co-presenter on the topic of Multi-Platform Destination Marketing on Saturday at Noon. Again, welcome — and here’s to an awesome TBEX 2014!